Canada’s winning streak at the 2014 FIVB World Championships has come to an end with a 3-0 (25-19, 25-23, 29-27) loss to Brazil in Katowice, Poland. Gavin Schmitt led all scorers with 18 points but the offence struggled to score points against Brazil’s strong serving and solid blocking. Click here to see stats and photos from the match. “Small details were the key mistakes in the most important actions and in crucial moments,” said Coach Glenn Hoag after the match. For the most part Canada stayed neck-and-neck with the No. 1 team in the world, but when opportunities to take control arose, the clean play we've grown used to disintegrated and disaster ensued. Canada was in control and held a four-point lead in the third, up 16-12, but sloppy play led to gap evaporating quickly. 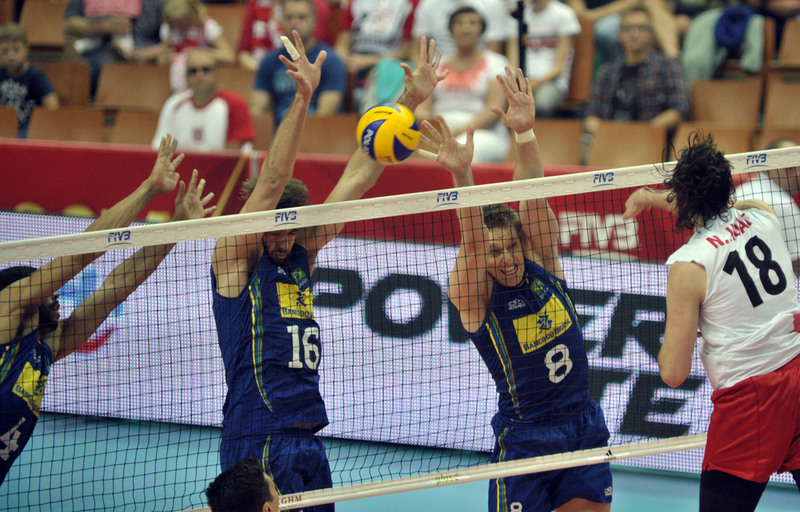 The breakdown continued at 23 all, giving Brazil match-point. Although Canada did well to battle and save five match-points, a huge block by Brazil after an incredible rally gave to Brazilians their ticket to the Third Round with the 29-27 win. The good news? Canada is still in the hunt to move on to the Top Six, but here’s what needs to happen: Russia has to beat Germany today. If the No. 2 team in the world can continue their undefeated play, then the Canucks will have a winner-takes-all showdown with Germany. The match will be played regardless, but a Germany win today will secure their spot, leaving Canada on the outside looking in. Here’s what you need to know about Team Germany: they’re as good as it gets. Their lone loss in the tournament came to Brazil, and have coasted through the majority of their matches. They also have an opposite hitter by the name of Gregor Grozer. If you haven’t heard of him yet, he’s one of the most deadly players in world world, with an absolute cannon of an arm. He’s lethal from the baseline, already racking up 17 aces in the tournament and has the athleticism and the skill to hit any shot. Sorry, make that 18 aces, he just rattled off another against Russia. Apart from Grozer, Germany has options at every position and then some. Outside Denys Kaliberda leads the tournament with a .579 efficiency, while middle 6’11 Marcus Bohme sits in 4th for blocks with 18. Last time we faced the Germans was also a do-or-die situation at the World Championships, ending up with Canada taking a flight home after just the first round in 2010. This time is undeniably different from four years ago. Now Team Canada has proven time and time again that they are amongst the best in the world. This time around, instead of fighting to belong, the boys in red and white are fighting to prove that they can dominate. In this world of the 21st century, there are ways as fans we can show our support. Tweeting your words of encouragement to @VballCanada and #TeamCanada can show the team that Canada is behind them. After that, all you have to do is come right back to Volleyball Source at 2:25 p.m. ET to watch the match and cheer on the boys to the Third Round! Click here to visit our Tournament homepage. Click here to see the Tournament standings.